Happy New Year!!!! I hope you all have a fun, safe, happy New Year celebration, a New Year filled with happiness, love, and beauty, and a bright, fresh, and fantastic year to come!!! Thank you all~ from all corners of the United States and from all over the world, for all of the beautiful comments and great friendships I have forged on this blog! When I started I had no idea what was in store and I am so lucky to have found you all!!! Thank you! I can't wait for the New Year and all of the beauty & inspiration to come from all of your posts! Much love to you and yours on this special night! XOXO & Bisou Mon Amis! Hello My Dear Friends! I do hope the holidays treated you well. My family & I had a beautiful Christmas as it was my sons First birthday (he's a Christmas baby) it was especially magical! It seems as though Christmas has a whole new meaning, everything is more special and our family traditions even more meaningful and important! I wish you all a very happy and love filled New Year!! Thank you deeply for the beautiful comments and well wishes left for me! 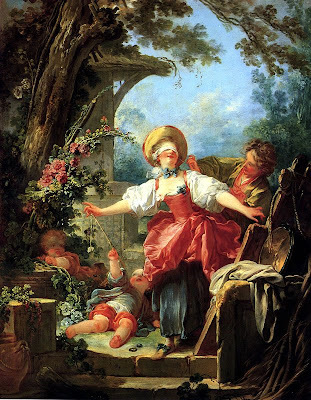 I have always loved Jean~Honore Fragonard. He has long been a favorite of mine. 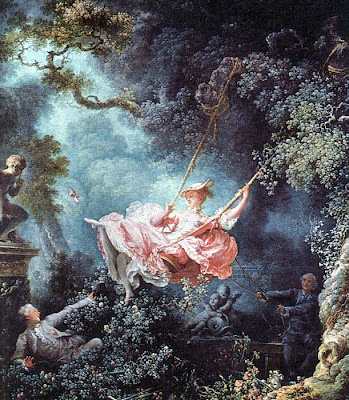 A copy of his painting The Swing hung in our foyer for years and I remember being a little girl looking at it (my mother also a lover of all things French and an interior designer). 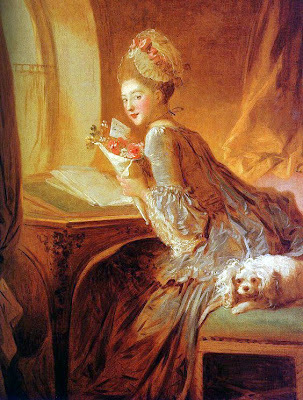 After reading a wonderful post by Lauren of Marie~Antoinette's Gossip Guide to the 18th Century about The Pursuit by Fragonard, I thought I would post some of my favorite works. Enjoy! Although it is very hard to pick my all~time favorite painting by Jean~Honore Fragonard (1732-1806), it was so fun to browse his works and learn more about the man, the painter, and his legacy. 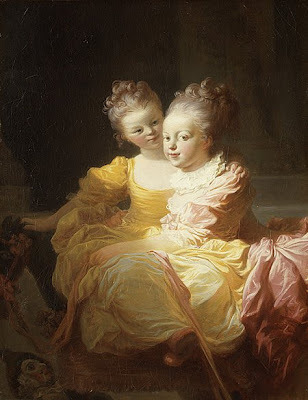 French painter of the rococo age, Jean~Honore Fragonard, was popular in the courts of Louis XV and Louis XVI for his delicately colored scenes of romance, often in garden settings. Born in Grasse on April 5. 1732, Fragonard moved with his family to Paris in 1738. He spent some time in the busy studio of François Boucher before successfully competing for the Prix de Rome in 1752. 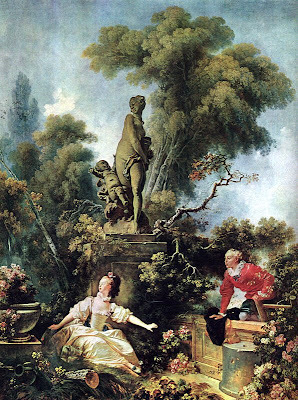 In 1756, Fragonard was sent to Italy as a pensioner of the crown; he remained at there until 1761. From the numerous black chalk copies he executed there, it is clear that he held masters of the Baroque in the highest esteem. He also produced brilliant red chalk drawings of the gardens of the Villa d'Este and painted small cabinet-size paintings for French private collectors living in Rome. The Stolen Kiss was painted for the bailiff of Breteuil, French ambassador to the Order of Malta in Rome. 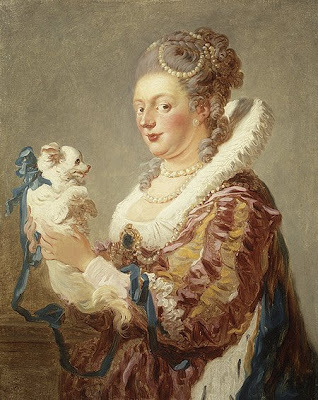 The Portrait of a Woman with a Dog is related to an inventive series of imaginary portraits referred to collectively as the Figures de fantaisie. They feature archaic costumes and brushwork so rapid and undisguised that it would have previously been associated with oil sketches rather than finished works. Fragonard's masterpiece is the series of large panel paintings commissioned by Madame du Barry, for the château de Louveciennes. While the iconography of the series continues to be debated by scholars, the subjects can generally be described as lovers in various stages of romantic involvement in lush, overgrown gardens full of mythological statuary, and cascading flowers. A dispute with du Barry led to the paintings being returned to him and replaced by another artist. After the French Revolution, he held administrative positions at the Louvre, but his work had fallen from favor and he died in relative obscurity and penniless in 1806. His paintings are largely known for the scandal they created. For example, The Swing became an immediate success, not merely for its artistic excellence, but for the scandal behind it. The young nobleman is getting an interesting view up the lady's skirts, not only that, but she is being pushed by her priest-lover, shown in the rear. In the same spirit are some other famous pictures, The See-Saw, Blindman's Bluff, The Stolen Kiss, and the Meeting. After his marriage in 1769, he began painting children and family scenes and even painted religious subjects. He stopped exhibiting publicly in 1770 and all his later works are commissions from private patrons. To me, Fragonard embodies the spirit of the ancien regime on the eve of the revolution. The soft palate and mutes tones, the images of love, courtship, frivolity, coquettish young ladies in voluminous clothes, and frothy flowers in lush gardens. What a wondrous and fantastical place these paintings can take us! Bonjour My Friends!!! Unfortunately, I am being kidnapped this weekend. My husband is taking me on a petite adventure this weekend. Don't be jealous though! He is an avid dirt~bike rider and is forcing me to go (I mean whisking me away) to the desert with him! It is dirty and sandy, but I'll be with him so that's all that matters! I'll be back next week & start posting then (after I take a shower)! Have a beautiful weekend! Wishing you a very happy and merry holiday! From my home to yours! May all of your holiday wishes come true!!! TangoBaby I have to say reading her blog changed my life, Ok, maybe not changed it, but definitely made it a brighter better place. I'm addicted now! 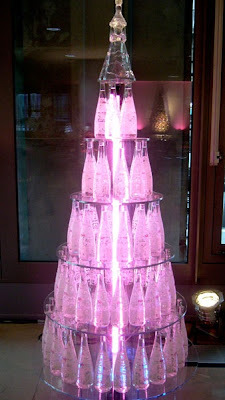 Paris Hotel Boutique I am obsessed with this beautiful blog! The images are always stunning and the content so original! I love visiting Catherine at Versailles and More, I always learn something new and it is always beautiful. I am not sure where these photos are from but I thought they were dreamy! Knowing my photo catalog, I'm guessing they are somehow French. 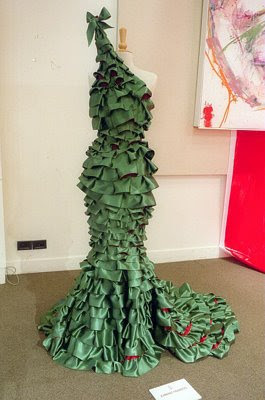 These Trees/dresses are fantastical! Okay Friends, I have a question. This maybe one of the worst blogging questions ever, but I have to know! A.) Go to their site and leave a Thank you comment (I often do this & it leads me to wonderful places). B.) Leave a Thank you response on my own comments beneath the one they left for me (I tried this but don't know if people come back to read them). C.) Go to their blog and leave a comment in return (not necessarily a thank you comment). I'm so confused I've seen all these options done. Is there a correct "blog" appropriate way to do this? And to all of you thinking, "how did this girl figure out how to turn on her computer"...I'm sorry, I am ignorant on this issue! Hey this blog is still new to me! 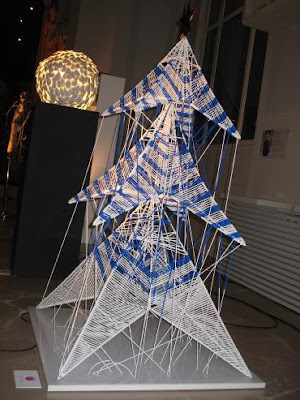 In Paris for the holidays the fashion world contributed 44 designer Christmas trees at the annual "Les Sapins de Noël des Créateurs" charity auction. A grand total of €101,000 was raised for the Sol En Si charity organization that helps children and families living with AIDS. The trees came in all shapes, sizes and designer styles. 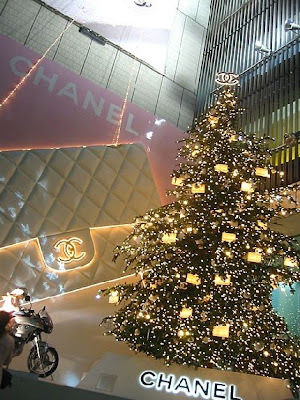 My personal favorite was Louis Vuitton's golden metal tree forged out of hundreds of LV emblems. 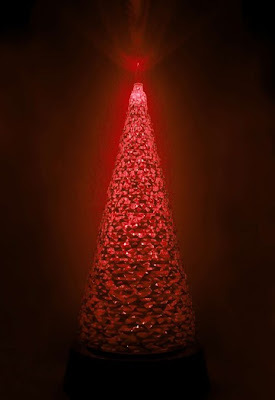 It was the first time that top name artists in the world of design had contributed to the auction. Designs by Norman Foster, India Mahdavi, and Jacques Rougerie, were among the top bids. 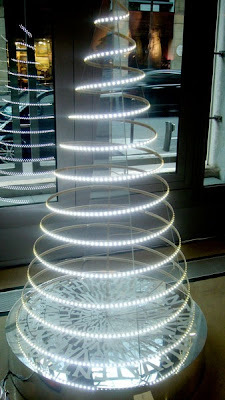 But it was the white column of circling shapes from Zaha Hadid that bid the highest for the evening. The fashion journalist Marie-Christiane Marek, who started the charity auction 13 years ago, said that the money would be used to create a residence in Togo for children orphaned by the disease. Amazingly, the total more than tripled the amount raised last year and the charity will be able to build much more than originally planned. Yippee! 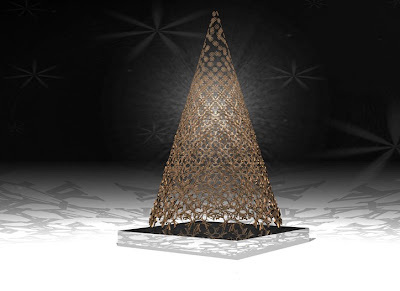 No live trees were used in the designs, making all of the trees sustainable luxuries. 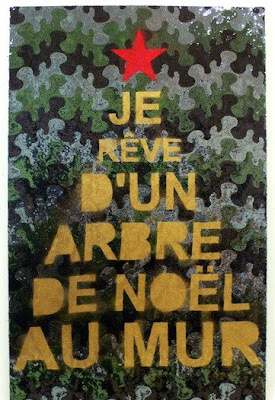 The French even do Christmas trees with flair. 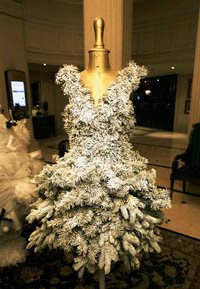 I love this idea, what a luxurious way to bring about some Christmas cheer. Well, I've been inspired to decorate my own tree now. I've been a bit of a Christmas Grinch this year. I need to get into the spirit and decorate. Happy holidays from my home to yours! 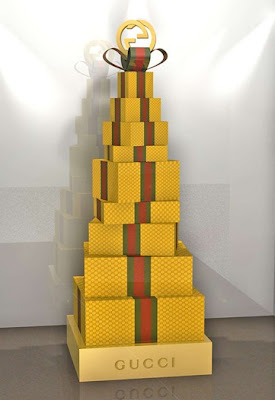 I hope that this holiday brings you what your heart desires most, and I don't mean the store~bought desires. Many, Many warm wishes your way! When I think of Marie Antoinette and the court of Versailles I always think of the pomp, the fashion, the silks, the hair, the incredible furniture, the Sevres, and undoubtedly the ...JEWELS!!! The French Crown & Imperial Jewels are unquestionably amazing, but even more amazing is their story and history. The following is glimpse into another world. A world where gossip, intrigue, fashion, and jewels held the highest position in court. Out shining even the monarchs themselves and even causing great political turmoil (ie the Affair of the Necklace). The State and coronation regalia had been last used in 1775 at the coronation of Louis XVI. They were then housed on display in the treasury. On the morning of 17 September 1792 a group of men broke into the treasury. Once inside, they broke the seals on eleven cabinets containing the Royal Crown Jewels, as well as the State and coronation regalia. The State and coronation regalia was, from a historical point of view, priceless: the Charlemagne crown; Louis XV’s 1722 coronation crown; the medieval gold sceptre of Charles V; the ivory-hand-topped gold sceptre called ‘le main de justice’; the Ampulla; the coronation sword (‘Joyeuse’), orbs, onyx chalices and assorted historic relics as well. Stored with the regalia was a jewel-thief’s dream: the enormous collection of gemstones gathered over decades by the Kings of France. 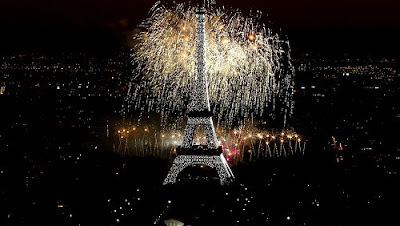 9,547 diamonds worth 21-million francs. Among these diamonds were the Regent, the French Blue , the Sancy, and the Hortensia. Also included in the collection was the Ruspoli Sapphire – a 135-carat Sapphire bought by Louis XIV. Modern sources conflict, but it appears six men participated in the robbery, including a man called Guillot. According to some accounts, Guillot took the French Blue to London, where he tried to sell it in 1796 to cover his debts. Guillot ended up in prison and the diamond disappeared. The Regent and the Hortensia were recovered in 1793 from an attic in Paris (a condemned man named Depeyron told police he had hidden a bag containing the gems and some gold in a house in the Halles district). No trace of the Sancy was discovered. 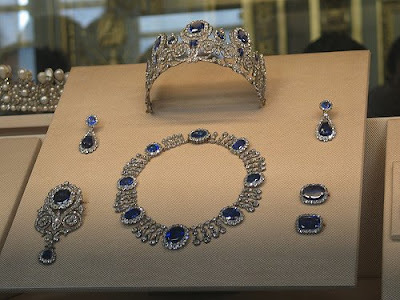 The Royal French Blue is believed to have been recut, and it is now known as the famous Hope Diamond. Sadly, In May 1887, the French government decided to organize an auction to sell most of the former Crown Jewels. Fearing attempts by either Royalists or Bonapartists to restore the monarchy, they wanted to sell the Crown Jewels before anyone could use them again. Everything was to be sold, except for a few stripped-down items of historical interest to be exhibited at the Louvre. One glorious piece from the collection is the tiara of Marie~Therese the only living child of Marie~Antoinette & Louis XVI. It is a beautiful Emerald and diamond tiara in a symmetrical design of scrolling foliage, mounted with over a thousand diamonds set in silver, and 40 emeralds set in gold. The royal jewelers who were assigned the task of designing and crafting the tiara were the Bapst brothers. 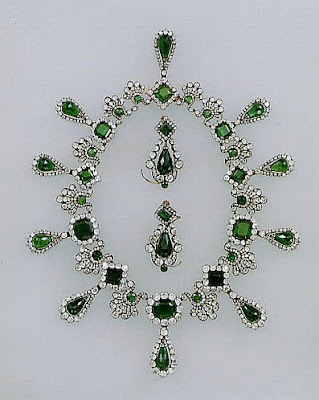 They used 14 of the largest emeralds from the crown collection. They also added 26 other smaller emeralds to the tiara, making a total of 79.12 carats of emeralds. 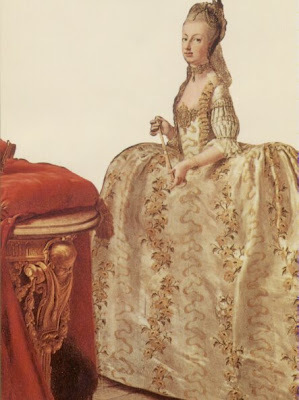 Before leaving for exile in Britain, Marie~Therese delivered the tiara to the French treasury. 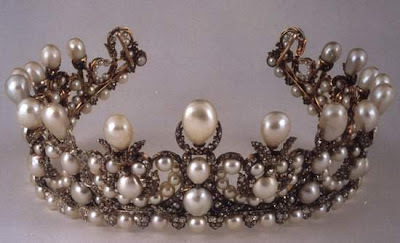 Over the years the tiara passed through many hands and was sold many times eventually landing in the V&A in London. The Louvre recently negotiated a very large sum of money to acquire the tiara and it is now housed there, home where it belongs! 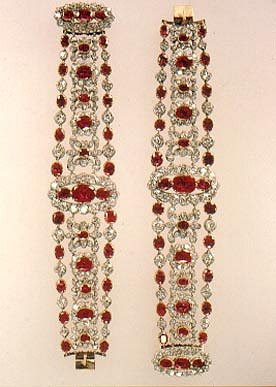 These Bracelets were also part of a large parure belonging to Marie~Therese. It consisted of a coronet topped by an eagle, a tiara, comb, girandole earrings, belt buckle, and the two bracelets. It was one of the crown jewels of France that came from the collection founded in 1530 by Francois I. Marie~Louise wore these jewels on her wedding day and after the fall of the Empire and the restoration of the Bourbon Monarchy they went to Marie~Therese. She was the last Royal to enjoy these Rubies as with the establishment of the third Republic they were sold. After passing through many hands, among them, renowned jeweler Tiffany, the bracelets are now housed in the Louvre and other the other pieces of the parure are in private collections. 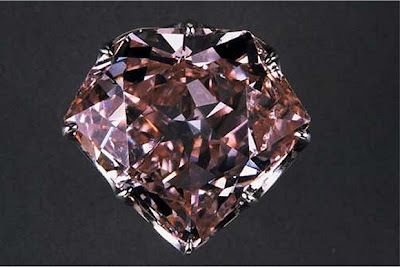 The Hortensia diamond is a gorgeous and rare diamond with a Peachy~Pink color and weighing in at over 20 carats! 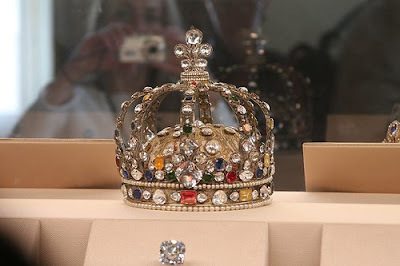 It is a diamond of Indian origin, purchased by King Louis XIV and since then has been part of the French Crown Jewels. The occurrence of pink diamonds is much less than 0.1 % of all naturally occurring diamonds in the world, this diamond is listed as one of the world's rarest in size and color. It does have a very thin crack in it. The Hortensia was stolen in the heist of 1792. It was recovered (along with the Regent) in 1793, when one of the robbers confessed to the crime & disclosed the hiding place of some of the hidden diamonds just before he execution. A bag containing gold and diamonds, that included the Regent and the Hortensia, was recovered from the attic of an old house. 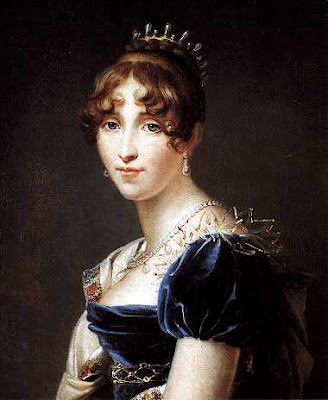 After the French revolution, The Hortensia was first mounted on the fastening of Napoleon Bonaparte's epaulette braid. 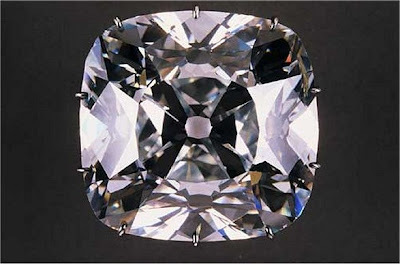 Later, the diamond was worn by Queen Hortensia of Holland, from whom the diamond derived it's name. 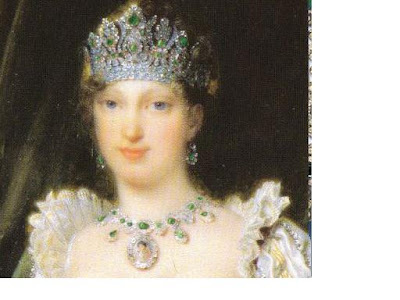 Later the Hortensia was set in a head band of the diamond encrusted comb, made for Empress Eugenie. 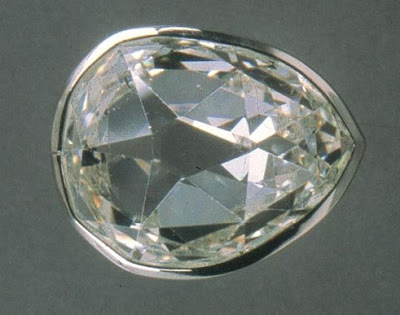 The diamond was stolen for a second time in 1830, but was quickly recovered. The Sancy Diamond a very interesting & colorful history. It is a pale yellow 55.23-carat shield-shaped stone. The stone was purchased in Constantinople in 1570, by the French Ambassador to Turkey, the Seigneur de Sancy, who was a collector of gems and jewelry. He brought it to France, where Henry III, who was sensitive about being bald, used it to decorate a small cap he always wore to conceal his baldness. During the next reign, when Sancy was made Superintendent of Finance, Henry IV borrowed the gem as security for substantial loan to hire soldiers. A messenger was dispatched with the jewel but never reached his destination; thieves had followed him. Knowing that the man was loyal, Sancy searched for him and his body was discovered, disinterred, and in the stomach of the servant they found the diamond! Could you believe it! It was then sold back and forth, it was in England and ended up in the hands of Cardinal Mazarin who acquired it in a shady deal and then handed it over to Louis XIV along with many other gems. It was also stolen in the heist of 1792 and was missing for quite some time. It reappeared in 1828 and again was sold back and forth until, in 1906 when the Astor family in America purchased it. A gift from Napoleon Bonaparte to Marie Louise (his second wife and niece of Marie~Antoinette) on the occasion of their wedding, this incredible Diadem was just one component in the parure, or suite of jewelry, given to her that day. 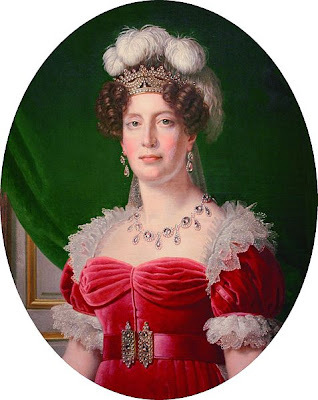 The components of the exquisite Emerald and Diamond parure of Empress Marie-Louise are an Emerald and Diamond Diadem, an Emerald and Diamond Necklace, a pair of Emerald and Diamond Earrings, an Emerald and Diamond Comb, and an Emerald Belt Clasp. 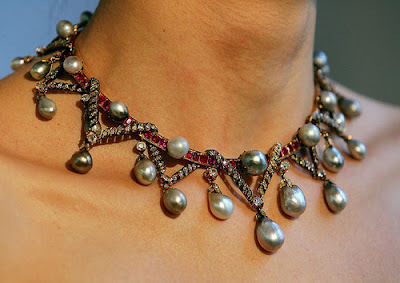 The parure was designed and executed by the renowned Parisian jewelers Etienne Nitot et fils. It consisted of 138 emeralds, 382 rose~cut diamonds and 2,162 brilliant~cut diamonds. This diadem (not a tiara because it is fully circular and a tiara is not) was allowed to be partially dismantled (it was purchased by Van Cleef & Arpels) and its emeralds re-set in other jewelry settings. 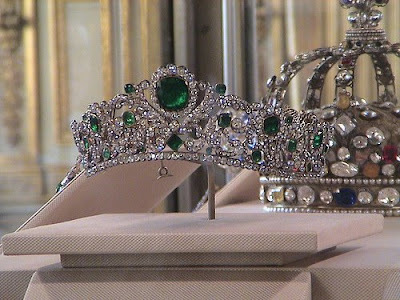 However, the original framework of the tiara has been preserved, the emeralds being replaced by turquoise but the diamonds remain original. 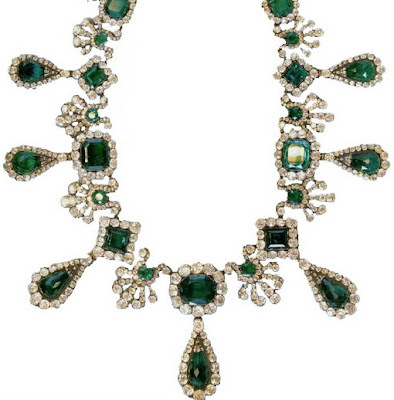 The necklace is composed of 32 emeralds, 264 rose-cut diamonds and 864 brilliant-cut diamonds. The necklace set in gold and silver. This necklace of great historic value, and imperial provenance, was preserved in its pure state, by the person who acquired it from the ancestors of Marie Louise. The Louvre Museum acquired the necklace together with the earrings, also part of the original parure, for the sum of 3.7 million euros where it lies today. The diadem is currently on display at the Smithsonian. 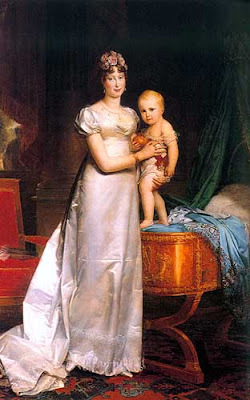 Marie~Louise gave birth to Napoleon II, future King of Rome on March 20, 1811. 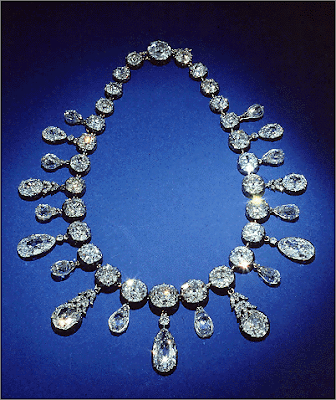 The diamond necklace which Napoleon gave to Empress Marie-Louise in honour of the birth of their son, is spectacular and famous! The necklace returned to Austria with Marie-Louise in 1814 and, after passing through the hands of Harry Winston in 1960, ended up in the possession of Marjorie Merriweather Post (who acquired much of the crown jewels and preserved their history) who left it to the Smithsonian Institute. Marie~Louise is seen wearing this necklace in many of her portraits. This incredible "push" gift comes in at a whopping 275 carats! Wow! When I gave birth all I got was a baby! Just kidding! 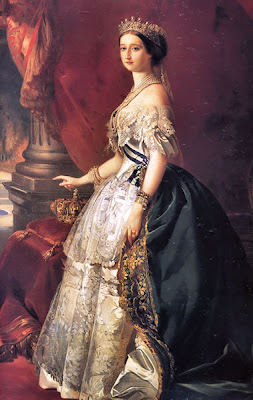 Now, if you think Marie~Louise was a jewelry junkie, Empress Eugenie can put her to shame! The Louvre houses her parure of Sapphires and Diamonds. As seen in the photo above. Empress Eugenie wearing her stunning Imperial Pearl and Diamond Tiara as well as other pieces from her parure. Empress Eugenie had this Pearl parure made for her wedding to Napoleon III. She had the jewelers take the napoléonique pearls which were from the vast "order of the Pearls" of which an original parure was made for Marie~Louise. This parure had been broken up many years bears prior and Eugenie took the exact same Pearls to make her wedding jewels. Eugenie was a well documented lover of Pearls and can be seen wearing her new set in the portrait. 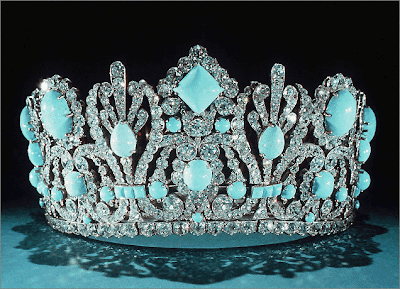 In 1992 the "Amis de Louvre" purchased the tiara and it now makes its' home there. 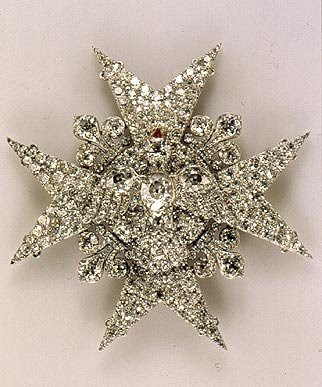 Among the Empress Eugenie's incredible jewels is this splendid diamond bow brooch, originally part of the “Diamants de la Couronne”, it was made by François Kramer. The impressive bow was originally intended as a buckle for a diamond belt. 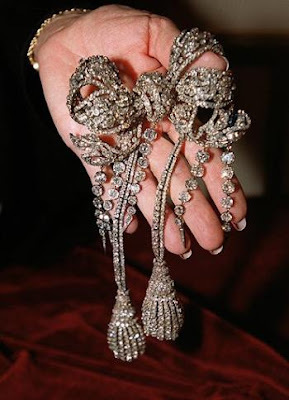 Eugénie asked her jeweler to make it more elaborate, to wear it with the pair of diamond tassels. Later five diamond pampilles were added. Ah, and now our most unfortunate Queen, Marie Antoinette, the last Queen of France! "These sumptuous pearls were given by Marie-Antoinette to Lady Sutherland, the wife of the British ambassador Lord George Leveson-Gower for safekeeping. Lady Elizabeth, Countess of Sutherland, is believed to have aided King Louis XVI and his family’s failed flight from France on 20 June 1791, during the French Revolution. While Marie Antoinette was imprisoned in the convent of the Feuillants, ‘Without clothes or money, for everything even to her purse and watch had been lost in the Tuileries, she had to depend on the charity of friends. 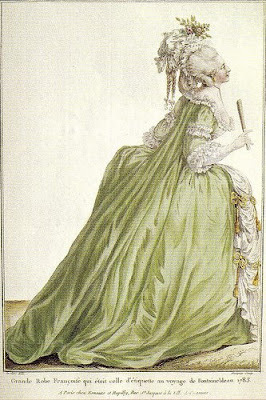 Lady Sutherland, who had a son of the same age as the Dauphin, had sent them clothes and linen.‘ (Joan Haslip, Marie Antoinette (London 1987), p. 265). This was reportedly the last gesture of kindness shown to the doomed Queen. It is no big secret that MA loved her jewels, in fact they got her in a lot of trouble from time to time. It is heart wrenching to think of all the jewels that have been lost due to the revolution. I imagine 1,000's of jewels were stolen and/or destroyed! Can you just imagine what is out there, maybe tucked away in secret, or people that own them and do not know of their history, or maybe some are hidden never to be discovered again because the theives are now gone taking with them their secret hiding spots. Or I imagine many were re~cut and now cannot be traced! After doing some research, I found that there is a lot of jewlery that belonged to the famed Queen that currently excist in private collections. Interestly enough many of MA's portraits do not portray her wearing many jewels. 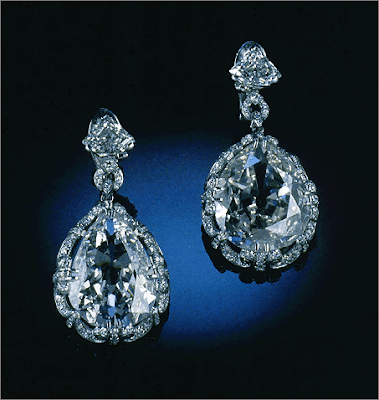 These fabulous diamond drop earings (14.25 & 20.34 carats) belonged to Marie~ Antoinette and are said to have been her favorites, are now housed in the Smithsonian, again due to the wonderful Miss Marjorie Merriweather Post who acquired the earrings from Pierre Cartier and donated them to the museum. (picture via the Smithsonian website). “Un superbe diamant brilliant blanc, forme carree, les coins arrondis, ayant une petite glace dans le filetis, et une autre a un coin dans le dessous: pesant 136 14/16 karats, estime douze millions livres." The story of the Regent is similar to that of the Hortense and the Sancy. Originally a 410-carat stone. It was discovered by a slave in about 1701. The slave stole it and concealed it in bandages of a leg wound. He offered a sea captain half the value of the stone for safe passage to another country. But during the voyage the captain murdered the slave and stole the diamond. Shortly after he sold the diamond for very little money and in guilt hung himself! Over time the diamond was cut into smaller diamonds and the principal gem, is today considered one of the finest and most brilliant of the known large diamonds. It is 140.50 carats! Wowzzers! In 1717, the gem was sold to Philip II, Duke of Orleans, then Regent of France, since that time, it has been known as the Regent Diamond. It was set in the crown of Crown of Louis XV and worn at his coronation. 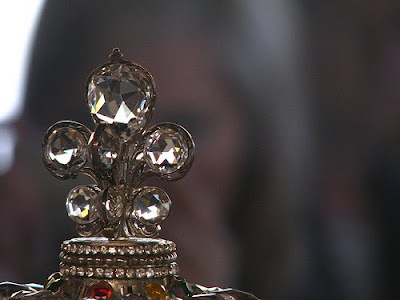 Removed from the crown, it was worn by Queen Marie Leczinska in her hair. Marie Antoinette used the Regent to adorn a large black-velvet hat. The coveted gem disappeared, in that darn heist in 1792, during the early part of the Revolution. Some of the gems were soon recovered, but the Regent could not at first be traced. After fifteen months, however, it was found, having been secreted in a hole in an Paris attic along with the Hortensia. In 1797, the great gem was pledged for money that helped Napolean in his ride to power. He had in mounted in the hilt of his sword that he carried at his coronation in 1804. When Napolean went into exile in Elba in 1814, Marie Louisa, his second wife, carried the Regent to the Chateau of Blois (does that mean she was stealing it)? Later, however, her father, returned it to France and it again became part of the French Crown Jewels. 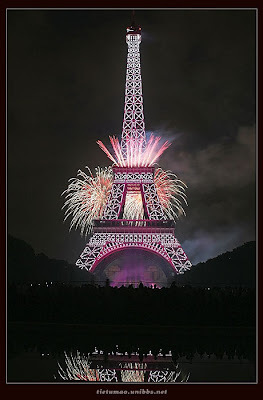 Well, my friends, I could not cover all of the amazing jewels that share their history with France. There are simply too many! I think I have posted a much too long post already. There is much more to explore if you are interested! I stumbled upon this magnificent site which has supurb images Royal Magazin, I highly recommend it. I think I just saw heaven! Ah! Then we'll dine at Maxim's!